The Justice for Montanans AmeriCorps program helps empower low to moderate income Montanans advocate for their legal rights and increase access to justice. 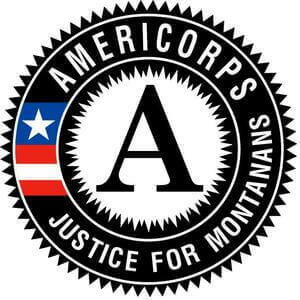 AmeriCorps members in our program serve with 6 different organizations to provide civil (non-criminal) legal assistance to low-income Montanans. Sites include Montana Legal Services Association, Supreme Court Self Help Law Centers, Office of Consumer Protection and Victim Services, Alexander Blewett III School of Law at the University of Montana, the Office of the Child and Family Ombudsman, and Legal Services Developer Program, Aging Services. AmeriCorps members perform a variety of duties including working with clients, providing legal information and referrals, helping attorneys with case management, developing outreach materials and presentations, recruiting and coordinating volunteers, helping survivors of domestic violence access services, and much more. Justice for Montanans members play a critical role in increasing access to justice for people across Montana. Low income Montanans are unable to afford the legal assistance they need to protect their basic needs such as housing, public benefits, and protection from unsafe living situations. Justice for Montanans members provide help in navigating the complex barriers of the legal system so that people can find the information, forms, and resources they need. In the seven years of the program, AmeriCorps members have assisted nearly 100,000 Montanans access free and low-cost civil legal services.